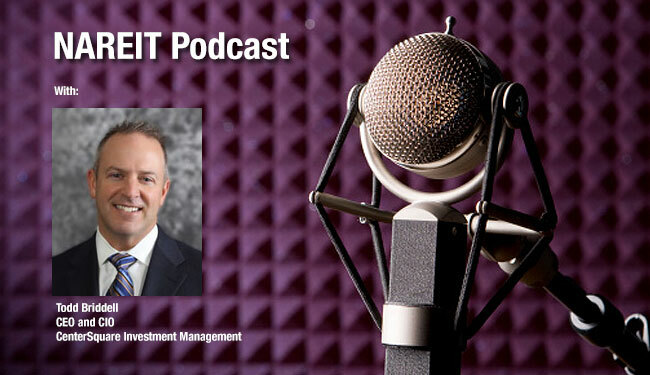 In the latest episode of the NAREIT Podcast, Todd Briddell, CEO and chief investment officer of CenterSquare Investment Management, discussed appropriate allocations to real estate in investment plans and how the upcoming election is affecting the REIT market. CenterSquare’s clients include pension plans, sovereign wealth funds and endowments. Briddell said most large institutional investors generally maintain permanent real estate allocations of 8 percent to 10 percent of their portfolios. Regarding the upcoming presidential election in November, Briddell said CenterSquare’s analysis of the implications of a national election normally focuses on potential public policy changes, including regulatory actions and monetary and fiscal policy. “It’s really unclear at this point in time that any new president is going to have a meaningful impact on any of those items in the near term,” he said. Turning to specific investments in the real estate market, Briddell said he’s particularly bullish on technology-oriented companies and sectors. These include REITs in the industrial sector that are involved with online retailers such as Amazon. REITs involved with service retail assets also are appealing targets, according to Briddell.